and I remember that this was the only dish in which I would tolerate green peppers. You may still prefer to use the canned soup as a substitute for the cream sauce in this recipe. Today, I've dressed up the casserole a bit with red peppers, onion and celery and a smattering of black olives. The next time I make it I may add a few sun dried tomatoes as well. While pasta is cooking, make sauce. Melt butter, add flour and stir to incorporate. Add milk, whisking well to smooth out any lumps. Cook or microwave until thick, stirring often. Add bouillon and pepper to taste. Set aside. In a fry pan, saute' vegetables until tender. Remove from heat. Add tuna and black olives and toss with vegetables. 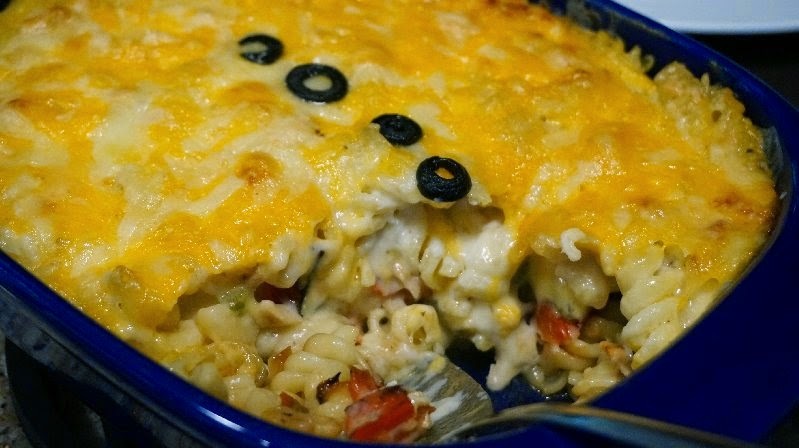 Arrange 1/2 of pasta in the bottom of a greased casserole dish. Spread 1/2 of the sauce over the pasta and top with all of the tuna and vegetables. Sprinkle with 1/2 of the cheese. Top with the remaining pasta and sauce. Sprinkle with remaining cheese and garnish top if desired with olives and/or peppers. Bake in a 350º oven for about 1/2 an hour or until casserole is bubbling hot. This sounds so good - I'm making it this week for sure! I was just looking for a "bumped up" recipe for a tuna casserole and there you are! Thank you and as Vicki said and I quote..."I'll be making it this week for sure"! LOL! No - no water. I used that to describe how much bouillon - as not everyone can get it in packages. The bouillon is strictly for seasoning. 2 cups milk is all that is needed for liquid unless you like your sauce thinner. Then I would add a bit more milk. Sounds like something I would like, but would have to use chicken instead! Looks delicious. That sounds really delicious Bev! I love how you can substitute and add things to this recipe. Hi Bev...made your rhubarb meringue dessert for that part it said l tsp.vanilla --but mine went beady?is there a error ? I made a lemon meringue pie this weekend and was frustrated when it beaded as well. Meringue is very dependant on the humidity in your kitchen. The vanilla doesn't have any affect except to add flavour as far as I know.. If you find a foolproof way of keeping meringue from shrinking and/or beading every now and again, I'd love to know the secret. Regardless, it still tastes good. Bev,, thanks for getting back---I think cream of tartar, would work. but your right it still is very good. I made this today and it was delicious! I used almond milk instead of regular milk, and it turned out great.